A new travel Web site has popped up which is taking an interesting approach to providing travelers with information they need regarding destinations around the world. Extremely puff-piece style press release aside, Chokti looks to have a different spin on researching your next travel location. Chokti pulls together information for a specific location from not just the official source itself but also a variety of other sources such as user opinions and guides. The information, often collected through RSS feeds from various Web sites, is geotagged and organized into a search engine. It makes use of a searchable map and accepts user generated content. Chokti said it will pull “together as much content as possible that relates to a certain topic in an easy-to-use format. The site can be used to: access guides to cities, museums, historical sites, parks, zoos, restaurants, hotels and amusement parks; distribute supplemental information through pdf files containing maps, coupons and vouchers; and promote current and upcoming events such as gallery exhibits.” It fully launches this fall. Wow, can’t wait! But I understand I’m trying to visit it and it won’t load at all, since it’s still in the beta stage? Thank you for your coverage of our launch, you have contributed to thousands of users coming to visit and try our site. We would like to extend our humblest apologies to those of you, like Gerri, who ran into a few difficulties accessing our service. As a beta this is bound to happen some times so dropping us a brief email to explain your problem is fundamental to the debugging process. Based on the responses we received, we have already made some changes to the site so please come back and try Chokti again. 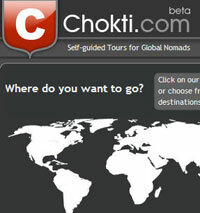 Chokti is the largest site for travel related user generated content on the Internet. We have 100s of places in over 20 countries with 1000s of media files made by professionals and amateurs alike. All of this organized by place, making your search results more pertinent than on any other site, including Google and Yahoo. And, we are growing ever day! So, come and visit us today.